All transactions are safe and secure with a reliable history in online purchasing behind each of our associates. Buy the Boondock Saints Brothers t-shirt to own Boondock Saints clothing and merchandise. The design on the front of this tee displays the movie title and the main characters who represent the words Veritas and Aequitas, which are tattooed on their hands. A Boondock Saints cross Rosary is normally worn on the wrist of each brother. The word "Veritas" means truth and the word "Aequitas," means justice (or fairplay). These words have their origins in Roman mythology. Support the Irish brothers with this piece of merchandise or one of the Aequitas Veritas Boondock Saints t-shirts below. 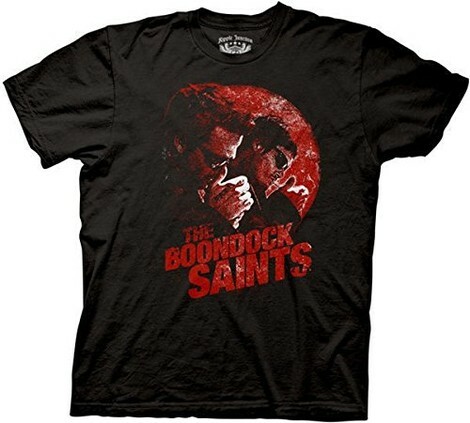 In addition to the Boondock Saints Brothers tee above, browse the Boondock Saints Clothing Gallery for more apparel like men's and women's clothes, kids shirts or hoodies.